Endometriosis is diagnosed microscopically by a pathologist who studies tissue harvested from the pelvis by a surgeon. The surgeon's eye is the only determinant of what is excised, so identification of all disease is important. There is a growing, but not yet widespread, appreciation that endometriosis has many appearances. Since descriptive morphology of endometriosis historically has been in terms of color (i.e., the "black powder-burn" lesion), this study seeks to categorize qualitatively and to estimate the prevalence of the various colors of appearance of biopsy-proven endometriosis. Among 137 consecutive patients with endometriosis, near-contact multiple-puncture laparoscopy or meticulous investigation at celiotomy, occasionally assisted by the operating microscope, allowed peritoneal abnormalities, no matter what color or size, to be identified and removed. Some patients had as many as ten separate specimens submitted for study by board-certified pathologists. Endometriosis was diagnosed by the presence of glands and stroma. The dominant color(s) of first impression of endometriosis lesions was recorded in each patient. Color terminology included clear, red, yellow, white, blue, gray, and black. Regarding the color appearance of biopsy-proven endometriosis among these 137 patients, 82 (60%) had black lesions. However, 91 (66%) had lesions of other colors, indicating that the black lesion is outnumbered. Forty-eight patients (35%) had black lesions only, while 55 (40%) had none. Forty-four patients (32%) had more than one color appearance. When lesions were clustered by the colors most frequently encountered (clear, red, white, all nonblack, black) and by the occurrence of these colors with any other color type and then arranged in order of increasing mean age of patients with similar color types, an evolution in appearance with advancing age is suggested (table 1). Total numbers of patients exceeds 137 because patients with more than one color appearance are listed in more than one appearance category. Color appearances "grey", "blue", and "yellow" are not listed separately because os small numbers. They are included along with other colors where appropriate in the "plus any other" color appearances. The visual manifestations of endometriosis are protean. The glandular elements themselves are usually quite small and frequently the color seen at surgery is due to fibrosis (giving rise to many of the white or yellow colors) and hemorrhage (resulting in many of the red). If endometriosis glands are like those of the native endometrium, they do not secrete blood. Human tissues or spaces that lack blood are typically clear or white (such as the vitreous and cornea, or a devascularized extremity), since the presence of blood is one of the main determinants of tissue color. This explains the concept of clear lesions (figure 1). Clear papules of endometriosis in the cul-de-sac of a patient who had undergone a previous "negative" laparoscopy. A tonsil suction tip is at left. Many older articles on endometriosis characterized patients in the mid-to-late 30s age range. This study finds that this age range is when the black lesion predominates. This may explain why the black lesion has been the predominant clinical manifestation acknowledged for decades. Clinicians failing to diagnose subtle disease on one occasion may be rewarded later in the same patient by finding "typical" or "black powder-burn" disease. The resultant clinical impression would be that "recurrent" or "new" disease has appeared, when perhaps only evolution in the appearance of the disease actually occurred, as is implied by the results of this study. A few authors have hinted at the variety of subtle appearances possible with endometriosis [1, 2], and Jansen and Russell  have articulated the concept of unrecognized, nonpigmented disease associated with "unexplained" infertility. They studied differences in a population of nonpigmented biopsies among infertile women, while the present study looked at all color appearances in consecutive patients. During the study, over 50% of the author's gynecologic surgical practice and over 90% of the biopsies taken in the study group were associated with endometriosis, indicating the wealth of return to be had by meticulous inspection and vigorous biopsy. Since all categorizations in this study were by the author, there is internal consistency on this point. More important than the author's opinion of color, however, is the fact that endometriosis has a myriad of appearances that may be missed by clinicians using panoramic laparoscopy looking mainly for black lesions. This simple study does not fully illustrate the nuances of appearance of endometriosis but presents an emerging picture of visual characteristics vital to the diagnosis, treatment, and study of the disease. The pelvic surgeon's guiding principle must be this: any abnormality of pelvic peritoneum, no matter how small, how subtle, or what color, must be considered endometriosis until proven otherwise by excisional biopsy. 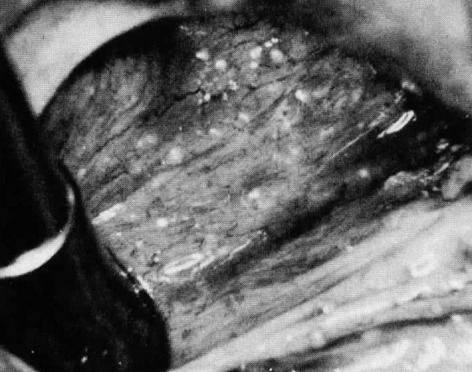 Endometriosis presents a large variety of color manifestations, most nonblack, and many easily missed unless meticulous inspection is used to identify small or nonhemorrhagic lesions. An evolution in appearance with age may occur, with resultant spurious effects on conclusions regarding the natural history of the disease. This study confirms and expands the concept of nonhemorrhagic appearances presented by Jansen and Russell . Jansen, R. P., & Russell, P. (1986). Nonpigmented endometriosis: clinical, laparoscopic, and pathologic definition. American Journal of Obstetrics and Gynecology, 155, 1154-1159.